I was excited to hear that The Storyteller II is looking for new writers and artists. I am an experienced comic writer and lover of fairy tales who counts Jim Henson’s The Storyteller as one of my favorite television shows and who loved the first Storyteller graphic novel anthology. I have read fairy tales from a wide variety of cultures, some particular favorites are the Norwegian “East of the Sun and West of the Moon” and the Grecian “King Midas” and “Eros and Psyche.” I find that Norwegian tales have a great sense of humour and frequently strong female protagonists, while the Grecian stories have such a wonderful tradition of mythology and literature behind them. I also love the later fairy tale classics created by such visionaries as Hans Christian Anderson and Oscar Wilde. In fact, I am currently adapting a comic book version of Oscar Wilde’s “The Happy Prince.” You can read the script here. 1. Flyaway, the story of a young woman and a young bird, and their desire to fly from their current situation to a warmer and more welcoming environment. 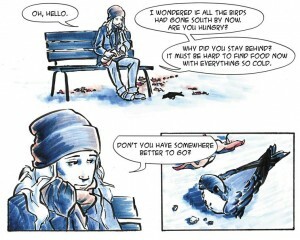 Published in Cloudscape Comics’ 21 Journeys. 2. 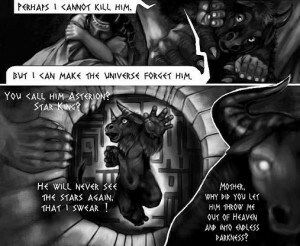 Fallen Star, the tale of “Theseus & the Minotaur” from the Minotaur’s point of view, as he wanders the Labyrinth, searching for a way out. Published in Cloudscape Comics’ upcoming Giants of Main Street. 3. My City, a very short story about a man’s love for his magic city. Published in Giants of Main Street. 4. Bewitching BC: Ghosts in the Capital, an exploration of various ghost stories and urban legends from Victoria, BC. Published in Gurukitty Studios’ Ghost Tales. The stories’ scripts (without the pictures) are available here: Flyaway, Fallen Star, My City, and Bewitching BC: Ghosts in the Capital. See my contact page for contact information.